Speakers at one memorial service will include former President George W. Bush. The family of Sen. John McCain has released details of his funeral and memorial services, with the ceremonies to begin in Arizona and end at the National Cathedral, where speakers will include former President George W. Bush. Wednesday, Aug. 29: McCain's body will lie in state at the Arizona State Capitol. There will be a small ceremony that family and local officials will attend at 10 a.m. local time. 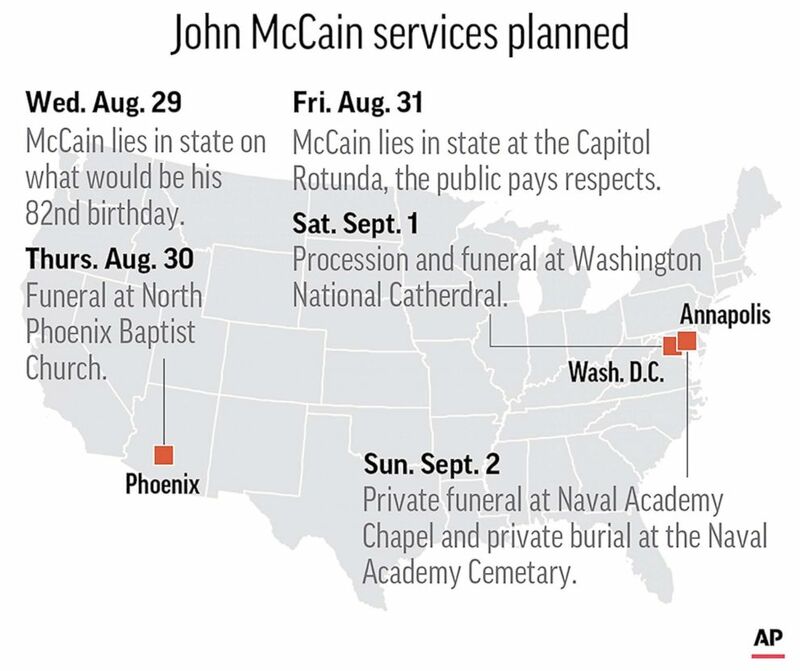 Following the ceremony, the public will be welcome to pay respects to Sen. McCain in the Arizona State Capitol Rotunda from 2 p.m. to 8 p.m.
(AP) Map identifies the ceremonies and events surrounding Senator John McCain. 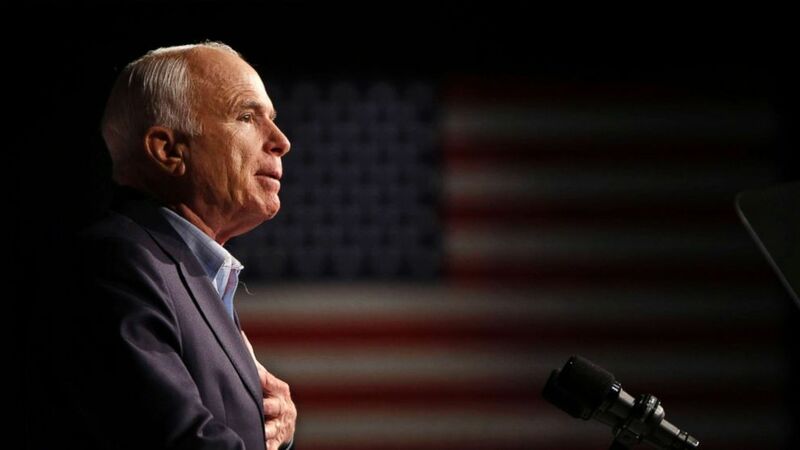 Thursday, Aug. 30: Memorial service at North Phoenix Baptist Church celebrating McCain's life and legacy. Eulogists expected to include former Vice President Joe Biden. After this ceremony, there will be a motorcade to the Phoenix airport, and McCain's body will be flown to Joint Base Andrews in Washington, D.C., and taken to a funeral home. (Gerald Herbert/AP, FILE) Sen. John McCain addresses a rally in Davenport, Iowa during his campaign for president, Oct. 11, 2008. Friday, Aug. 31: McCain's body will lie in state at the U.S. Capitol Rotunda, where the senator's family, colleagues, staff and the public will honor his life and service. A ceremony will take place at approximately 10 a.m.
Saturday, Sept. 1: There will be a motorcade from the Capitol to the National Cathedral, with a stop along the way for the late senator's wife, Cindy McCain, to lay a wreath at the Vietnam Veterans Memorial. Former President George W. Bush will give a eulogy at the National Cathedral. Other likely speakers include McCain children Meghan McCain and Jimmy McCain. The New York Times reports that former President Obama has also been invited to deliver a eulogy. Sunday, Sept. 2: A private memorial service will take place at approximately 2 p.m. in the U.S. Naval Academy Chapel in Annapolis, Maryland. Following the service, a private burial ceremony will be held at the U.S. Naval Academy Cemetery where Sen. McCain will be laid to rest next to his Naval Academy classmate and friend, Adm. Chuck Larson.